Reco ‘Mole’ Cumberbatch has become a cult phenomenon on the Barbadian music scene. Known for his raunchy and equally witty and catchy lyrics his energetic style has gained him a loyal fan base who simply go crazy when he belts out his familiar refrain ‘Daddy now land’. When quizzed about his moniker he explained, “Basically Mole was just A nickname one of my childhood friends kept calling me and then everybody started calling me it so when I started singing I Just used it since everyone had already knew me by it. Mole is a skilled writer and he has the ability to paint a vivid picture with his imagery. He derives immeasurable pleasure from writing his own songs and is thrilled by people actually loving his work. Since becoming a staple on the local scene he has secured his spot in the lineup of some major shows. 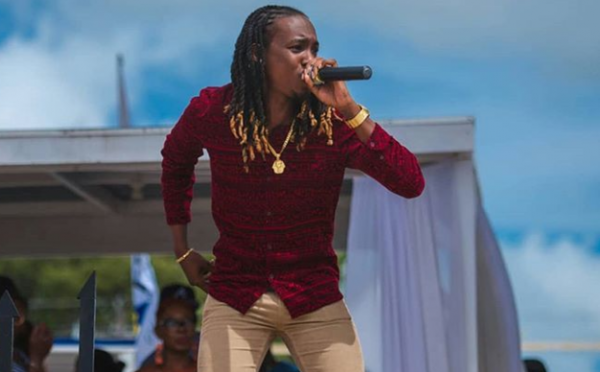 Reggae on the Hill, Soca on the Hill, Reggae on the Beach, Gimme Soca and Brek-fus audiences have been electrified with his lyrical offerings. Mole has also had the opportunity to share the stage with internationally acclaimed acts on Reggae Splash. Locally he has taken his craft to the competition scene and has advanced to the finals of the Bashment Soca Finals. Though shy by nature he goes through a metamorphosis when he is on stage. One of his fondest musical memories was Reggae on the Beach 2015 when he was performing alongside fellow Barbadian singer Lady Essence. This was his first major stage performance with thousands looking on. The adrenalin he felt fueled by the massive crowd response was riveting and highly addictive. The entertainer draws inspiration from a host of stellar artistes including Vybz Kartel Popcaan, Dexta Daps, Aidonia and Barrington Levy. Mole’s catalogue of music includes favourites like ‘Ish’ which had its own accompanying dance ‘Wukless Brute’ , ‘Bring My Glide’, ‘Bathe Before Yuh Leff Home’, ‘Do It Fa Daddy’ , ‘Boom Flick’ , ‘Hornaman’, ‘De 40’ and ‘Facebook Girls’ . The artiste who has worked with local producers including Dutty Tallics, King Bubba, Monstapiece, Minim and Gorg has a penchant for creating music which is not only fun but also forces you to move. It is simply direct and straight to the point. With a style that is uncensored and comical the performer revels in these characteristics that make his material unique. With music being his fulltime job Mole is not simply enamored with creating his music but has branched into different elements of the entertainment scene. Outside of performance he has also ventured into hosting his own events. Ultimately, he is focused on taking his inimitable style of music and performance to international markets and has made a strategic alliance with Superlynks Publishing as he prepares to make a global impact.